From left to right, Dr. Gurpal Bhuller, Consultant Orthopedic Surgeon, Charlie Renland Volunteer OWM, Maria Khanuja, Co-Founder and Logistice Co-ordinator OWM, Chief Executive Officer, GPHC George Lewis, Co-Founder, OWM, Dr. Paul Khanuja, Dr. David Samaroo, Head of Orthopedics, GPHC and Senior Registrar of Medical and Professional Services, GPHC, Dr. Kaaleshwar Ramcharran. Forty-seven patients are on their way to walking again thanks to Operation Walk Maryland (OWM) which conducted 53 operations over four days on their first trip to Guyana. Six of the patients requiring knee joint replacement had to have operations done on both knees. Of the 47 persons benefitting from the joint replacement surgeries, 29 were female while 18 were male. Although OWM originally aimed for 50 replacements, of the 53 replacements done, 35 were on the knees and the other 18 were hips. The team is expected to return in January to conduct follow up examinations and to determine how they can help to develop a sustainable programme locally that will allow more Guyanese to access the service throughout the country. At a press conference to highlight the work of OWM, Dr. David Samaroo, Head of Orthopaedics at the Georgetown Public Hospital Corporation noted the project was a record achievement, worthy of being recognised. Dr. Ramcharran explained that this is due to the fact that these surgeries are expensive. Such a procedure at a private hospital would incur a cost of $2M inclusive of attached fees to conduct a joint replacement surgery. Previously, OWM, patients would have been asked to pay a minimum of $200,000 to the hospital. This covered the cost for the replacement joint while the surgery would have been free of cost. 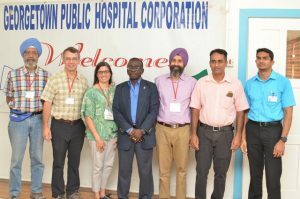 “Operation Walk, through their generous supporters and donors they were able to garner enough donations to make these surgeries free of cost for all of our patients here in Guyana. So those patients who would have initially paid the $200,000 and were awaiting surgery by local surgeons, those persons are actually going to be refunded,” Dr. Ramcharran was quoted as saying by government’s Department of Public Information. Chief Executive Officer of the GPHC, George Lewis envisioned that accessing orthopaedic surgery is likely to be less of a hassle as the OWM will work with the Ministry of Public Health to ensure that it is made available to throughout Guyana. The team of six orthopaedic surgeons is headed by Dr. Paul Khanuja, Co-Founder of Operation Walk Maryland. He has indicated that this is their ninth international project, this being the first to Guyana. OWM is a private, not-for-profit, volunteer medical service organization that provides free surgical treatment for patients in developing countries and in the United States.